This book is intended for general practitioners, optometrists, doctors in training and others who have responsibility for diabetes care. It is not intended to make them self-sufficient in screening and recognition of diabetic retinopathy, but rather to enhance their role in diabetes care by increasing their understanding of diabetic retinopathy and its implications for overall diabetes care. Diabetic Retinopathy is a well-illustrated, clearly structured and accessible reference guide. It includes a description of diabetic eye disease and its significance not only to management of the eye, but also generally to any person with diabetes. It includes referral guidelines and guidance on locality screening programmes and methods. The book illustrates the different types of diabetic retinopathy as well as other common retinal abnormalities that are likely to be seen. There is also a self-assessment section. 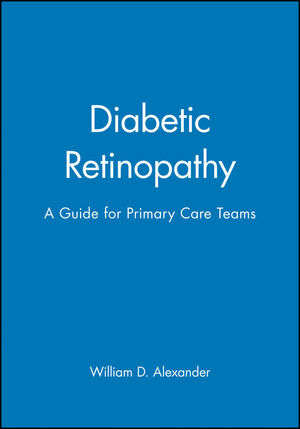 William D. Alexander is the author of Diabetic Retinopathy: A Guide for Primary Care Teams, published by Wiley. 2. Examining the eye in diabetes. 3. Preventing visual loss and blindness. 4. The treatment of diabetic eye disease. 5. The general management of the person with diabtic eye disease. 6. The management of visual loss and blindness. 7. Other commonly seen retinal abnormalities.